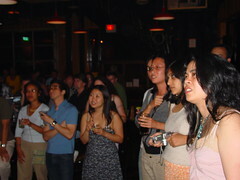 Kundiman took over a bar in Charlottesville. Orbitz graciously allowed us to change the channel from SportsCenter to HBO's Def Comedy Jam. One of the Kundiman Fellows, Kelly Tsai, was scheduled to perform. The whole troupe of Kundiman fellows, faculty, and staff attended.